Although tandoors have been used to cook bread for thousands of year, Indian cooks use it for meats only since WWII. Tandoors cannot cook meat properly unless you prepare it in special way. The very high temperature at the bottom of the oven would burn the outside of any meat in about 20 minutes, leaving the inside raw. How do they do it then? The secret is to prepare the meat to reduce the cooking time, by scoring it and marinating it. Why bother? Because the high temperature gives the meat a taste you just can't get with any other process. 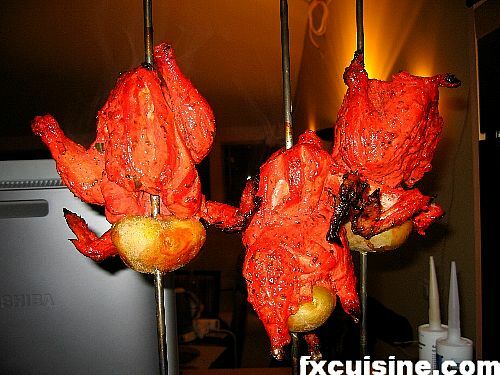 I'll show you how this works using the most famous of all tandoori dishes - chicken tandoori. With a tandoor it's easy to make it better than any Indian restaurant, because they have to let the meat marinate too long or precook the chicken in the tandoor so they just have to heat it up again before serving, they often use store-bought marinades and the chicken quality is just lacking. Not that they wouldn't know how. But they are in the business to make a profit, not to make the best tandoori chicken. That's what we do. 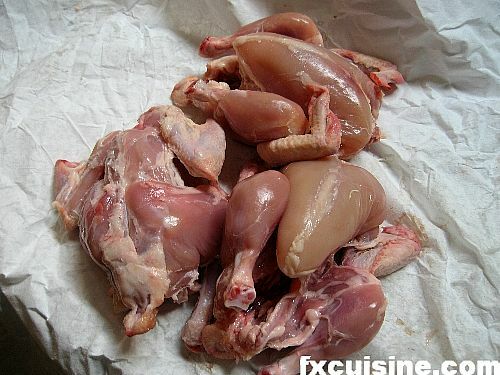 Take a few baby chickens and skin them. 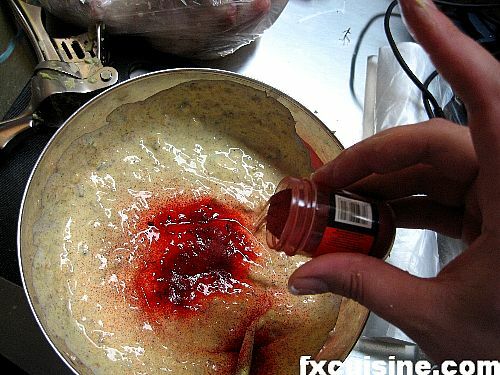 I know it's a pity to disgard the skin but it's necessary for the marinade to tenderize the meat properly. And the skin is where the fat is anyway. Score the tighs and breasts deeply so that the marinade and the tandoor's heat will penetrate to the bone. 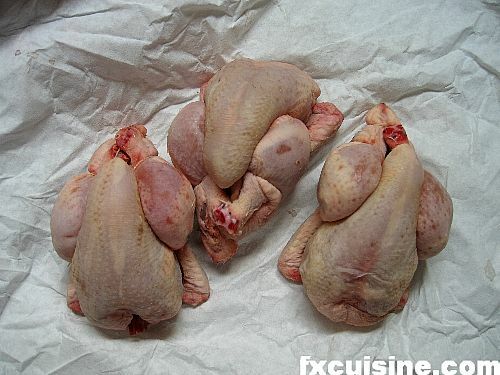 Put them in a freezer bag and squeeze one lemon for each chicken, add some salt and leave for an hour. 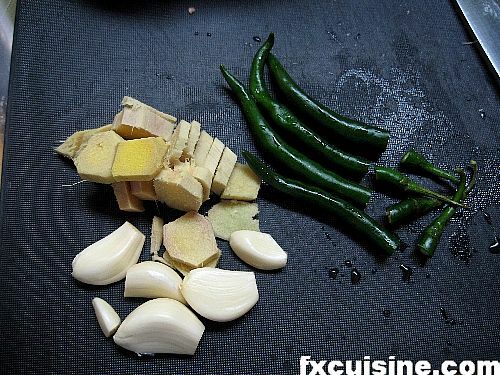 While the meat is being tenderized by the acid in the lemons, prepare the marinade by crushing 1-2 garlic gloves, fresh ginger and 1-2 deseeded hot green or red chilies per chicken. 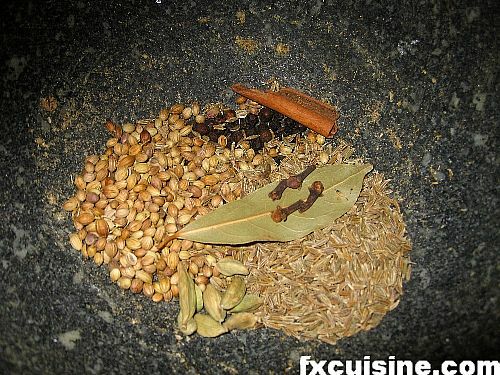 Take whole peppercorns, coriander seeds, cumin seeds, cardamom pods, cloves, bayleaf, cinnamon and grind down in the finest powder you can with a spice grinder or mortar. 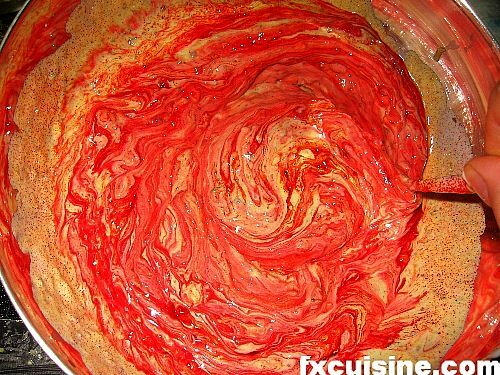 Now you can use the marinade like this, but people associate taste with color and my guests all agree that it 'tastes' better when the dish is red. 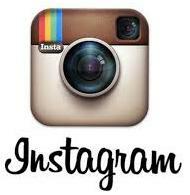 Humor them and just add red food coloring. Then mixe thoroughly. You can either go for a super smooth, sieved marinade, or for one with little crunchy bits (ginger, garlic, spices) to add interest. Your call. 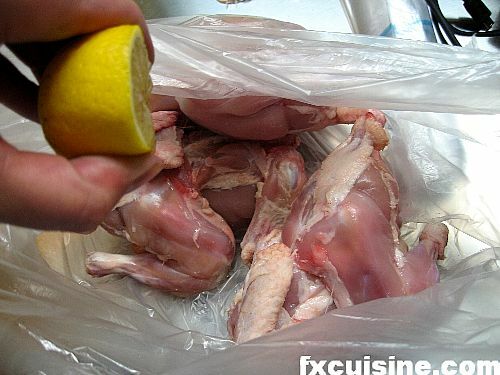 Pour the marinade over the chicken in their bag, leaving the lemon juice. You could also use a new bag and add fresh lemon juice. Leave them for 4-6 hours. In Indian cookbooks they marinate for much longer times because their meats is 'fresher' and much, much thougher. 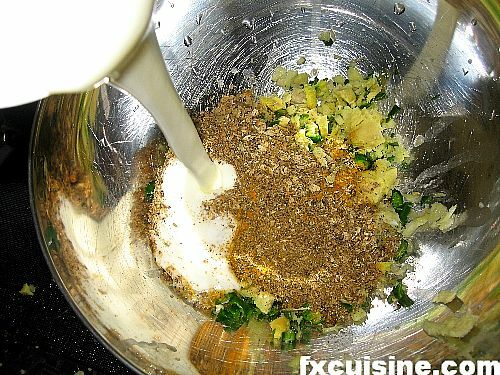 If you overmarinate you'll end up with an unappetizing mash-on-the-bone. Don't you do this recipe with chicken breasts because only 30 minutes in the marinade will reduce it to porridge. You have to use a whole chicken.